区块链日报 - Token Economics #1: Why do we need Token Economics? Token Economics #1: Why do we need Token Economics? Token Economics #1: Why do we need Token Economics, still? This is the first one in a series of articles focusing on Token Economics research, mechanism design, use case studies and more, developed by a group of professionals from different background in financial, consulting, ventures, funds, blockchain projects, and public blockchain. Following the spirit of Santa Fe Institue, who was established in the late 1980s, and had leveraged people from the multi-discipline background to develop a new discipline called Complexity Economy by combining the opinions from various angles to explain the economy in a disequilibrium situation, we hope to systematically define what Token Economics is, where it comes from, why it values so much, how to design a compelling Token Economics model, what are the good examples and bad ones, and many more. Token Economics is not just for the fading trend of ICO, it is also embedded deeply into the DNA of your projects. Think clearly before you start cause this is the real value to determine how far a project could go. And especially in this chilly winter, more than ever you will need it. Chaos and noise, no matter you like it or not, has been in existence since the Big Bang, and it is also one of the several primary stages for technology adoption and market evolution. In this bitterly cold winter, especially for blockchain, it seemed people have become accustomed to the current situation and claimed they liked the bear market since it would crowd out the bubbles. Well, this self-soothing claim actually won’t help to make the market to surge again. What truly helps is to re-think, study, research, and practice, to find correct signals among all these noises, and then swing into actions. So, what are the true signals? 1. Technology progress to solve the current issues in throughput, scalability, security, privacy, easy-to-use for developers, and more? Yes, absolutely! However, this is far from enough. 2. The blockchain is not only a technical tool, when you implement blockchain technology into your business or start a new blockchain venture, I believe, soon you will find the logic for business operation is entirely different because of the blockchain and involvement of token, and you will need a set of rules to explain and guide how to unleash the power of blockchain. And this is where Token Economics works. An economy doesn’t just start from scratch, it emerges from its underneath technology and it is the expression of the technology. And Economics is a set of principles, rules, methodologies to guide the exploitation of technology and operation of the economy. The year 1962 witnessed the publishing of a book called The Structure of Scientific Revolutions, written by Thomas Samuel Kuhn. 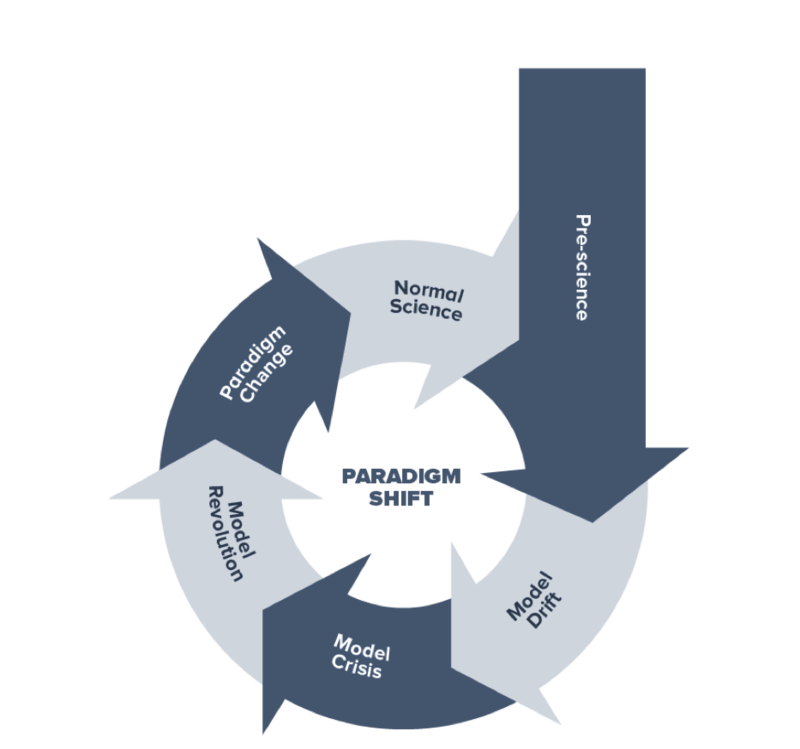 A fundamental concept — Paradigm Shift was introduced from the book, whose main idea is that when a new or disruptive technology emerges, either from innovation or a combination of the previous techniques, it will eventually follow the shift circle and cause the old paradigm to be changed to a new one, or a new way of business operation to explain and support the new technology development. For blockchain technology, it has two key elements, the decentralized network and the distributed ledger, and these have caused a very fundamental change, which is the trust can be guaranteed by machine, by algorithm, so you don’t have to rely on a 3rd party, like the transfer agent, or custodian, or an escrow bank to act as the endorsement, blockchain itself is a trust delivery machine. And this will break the traditional boundary of the company, market, and the governance structure. 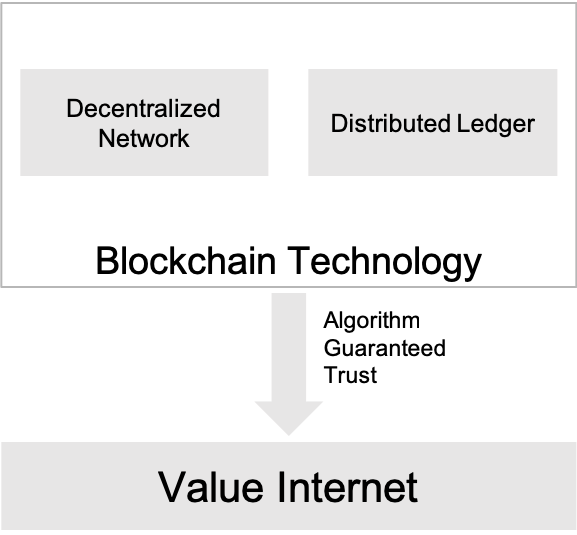 With blockchain to be the backbone, the token, which is the symbol of trust and value, can be transferred from A to B without a central organization involved, and now we have entered into a new era called Value Internet. For internet economy, its core operational logic is driven by user traffic. Companies like Google, Facebook, Amazon, or Netflix, they all create different kinds of contents to attract users, and then they are looking for ways to monetize these traffic, and the most ideal situation is to provide everyone precisely what they want(accurate match) to make the most value of the user traffic. 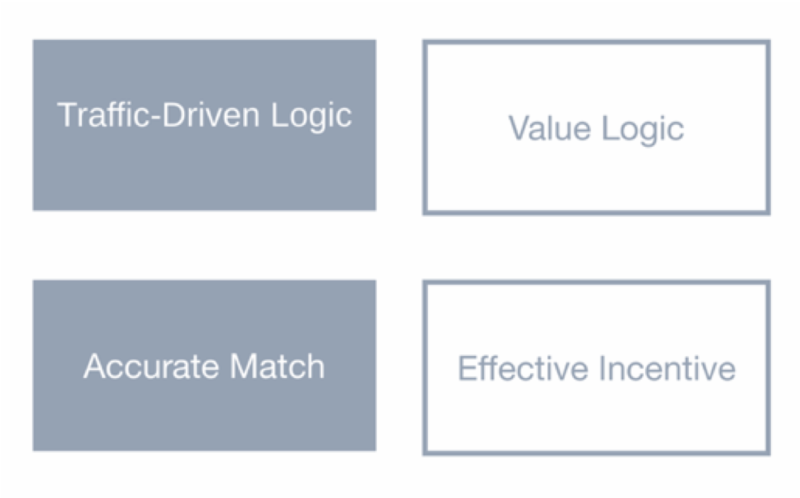 While for token economy, the logic would be entirely different, since the value can be circulated in the blockchain network, the business logic would change to how to create value, how to make a much bigger pie, and in order to create a bigger pie, you will need to think more about how to create a compelling economics model to embrace your partners, suppliers, clients, and even your competitors to contribute to the whole ecosystem. Why do we need Token Economics? Token, as the symbol of Value, is the core of the whole economics model. As indicated in the left part of the chart, token economics cares about how value is created, how to distribute and circulate it among your community members, what are the mechanisms to consume the tokens, actually you will need to set up a delicate financial model to make it work. Also, token is deemed as a confirmation of rights, to get the reward and rights when you contribute to the community, so this is the right part, the incentive model. In this part, token economics will research what kind of organization is suitable, what the incentive model is, and what are the changes to the governance model. Let’s have an example here, when the textile machine was newly introduced in England in the 17 century, it significantly changed the way people work and live. In the past, they worked in a small family workshop, producing textile manually, while with the machine introduced, a new kind of organization — the factory emerged, so people started to work in the factory, with a fixed working time, and got paid according to their workload, also different kinds of management methods were created accordingly to facilitate the whole process. The blockchain is the new textile machine, and we will need a new organization structure, a new incentive model and governance model to fit for it. Put it simply, DAC is an entity that lives on the internet and exists autonomously, it’s formed by a ground of people who share the same consensus and are willing to contribute and share the benefit of the success of DAC. It brings a new way of collaboration and incentivization. In the traditional industry chain methodology, a company is an independent entity, and its main purpose is to buildup its competitive advantages and make profits for itself, but the more profit you get, the less the other member of the industry chain will get, so it is a zero-sum game. While for DAC, people are thinking about how to maximize the value for the whole ecosystem, community members will gain tokens by contributing or exchange of resources, thus all the members become stakeholders. Token holders can participate the governance, operation, and data using of the community, blockchain technology enables the automation operation of this mechanism in an open and fair way. So it is a win-win situation, which is totally different. What is an ideal token economics model? Well, it depends, different businesses might have different models, and it also serves to different operation purposes or strategies, but one general principle to follow for designing it is The Grand Ecosystem. Currently, most projects are focused on the left part, which is full of speculators and investors. Some projects just issued a token and conducted marketing events to manipulate the price, so the token is floating over there, not having real business connection and value. When some bad news is coming, these speculators will just sell the token and run away, and that is why the cryptocurrency market fluctuates so violently. 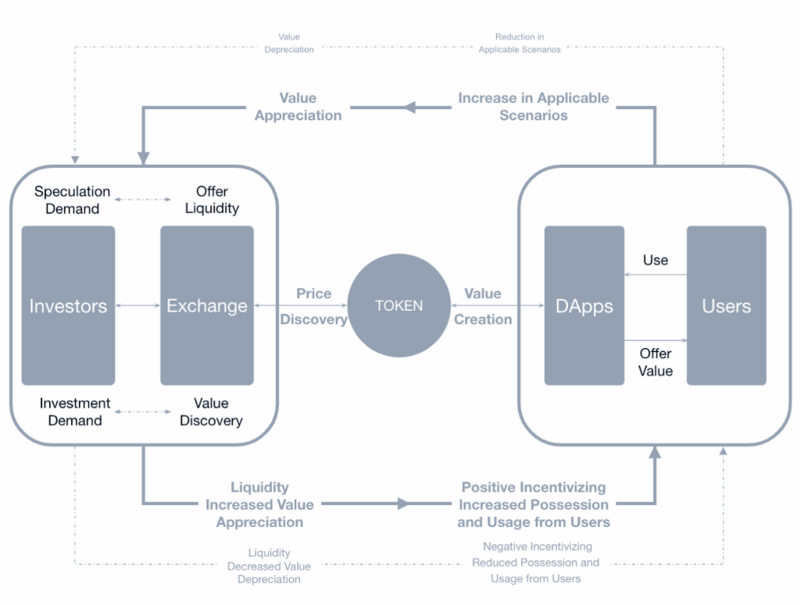 The exchange is a great place to make the price discovery and provide liquidity, which is very important for the business operation, but you cannot miss the right part of the chart, these tokens should have actual meaning in business operation and should help to provide value to the Dapp Users. When token creates the real value, it will support the price in the exchange, which will drive the positive value circulation. In the coming articles, we will discuss more practical use cases about how to design the Token Economics. Stay tuned! Token Economics #1: Why do we need Token Economics? was originally published in Hacker Noon on Medium, where people are continuing the conversation by highlighting and responding to this story.